You do realize it looks real? People will stare at you! Your temporary tattoo goes on any part of your body. Be ready to ignore questions like, "Hey, where did you get your body from?" Features: What makes it different? Easy and quick to apply and remove. You will know how to do it within seconds when you see instructions on packaging. How to Make a Temporary Tattoo Last Longer? Use a soft brush, such as a makeup brush, to gently apply a thin layer of talc or baby powder to the surface of the tattoo. Disclaimer: NOT for children under 3 years old. Not for nursing or pregnant women. The baby beside or inside you could be scared of you wearing tattoo and cry. Exclusively sold by Uni Gifts Shop; Supperb(TM) is a registered US brand. Long lasting and waterproof. They will not wash off and will last for 2-3 days. (If you don't rub temp tattoos against clothes, it will last even longer). 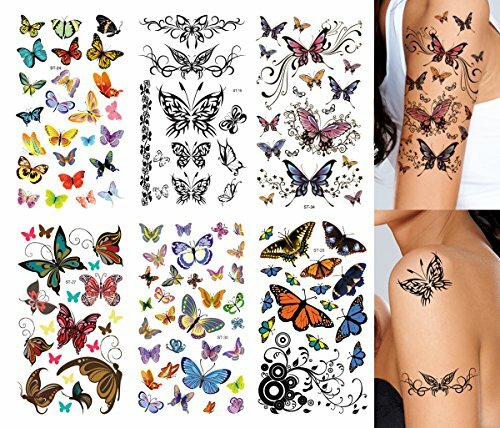 Supperb Tattoos are suitable for everyone, women, men, girls and boys. Wear supperb tats on your arm, face, hand, neck, shoulder, lower back, leg, wrist, ankle, chest, hip or anywhere you like. Easy to Apply. Easy to Remove. No Mess, No Pain, No Commitment, No Regrets. Wet cloth against ack of tattoo. Press down and make sure to wet it thoroughly. Wait 20-30 seconds, peel off paper backing. Gently rinse image with water for best effect. brush with your skin-toned face powder to set. If you have any questions about this product by Supperb, contact us by completing and submitting the form below. If you are looking for a specif part number, please include it with your message.